It is well known that, among other diseases, cancer threaten many people’s lives no matter age, wealth or social status. Specialists believe that genes and genetic predisposition are key in this serious issue, others put the emphasis on other major factors such as climate, polluted air and water, life style, thoughts, etc.. What is certain though is that we do not have one exact answer to this spread and life taking disease, which is not considered illness in some specialists’ opinion (some brave people even consider it a “toy” that has to be beaten joyfully), but a health state that alarms about human body and its bad function as a consequence. Some Armenian doctors confirm that they do not know the reason of the generation or development of cancer, in spite of the existence of various theories of its genesis. In this article I decided to tackle a little bit the cannabis oil and cannabinoids matter over cancer cells, since there were people who affirm that they had healed their cancer of even IVth stage. Scientists, on the other hand, have found different biologically active components in marijuana and called them cannabinoids of different types. However, it cannot legally be prescribed and sold in drugstores under federal law (even though this topic is highly discussed recently in many countries such the UK, Poland, etc. in order to pass it legally). Although, according to the American Cancer Society, two types of drugs based on marijuana compounds have been approved in the US medicine: Dronabinol (Marinol), as an antioxidant delta-9-tetrahydrocannabinol, approved by the US Food and Drug Administration, helps relieve pain and reduces inflammation; Nabilone (Cesamet), a synthetic cannabinoid that is used in case of nausea and vomiting caused by chemotherapy, like Dronabinol. As to marijuana oil, it is not approved by the US FDA for any medical use, except for marijuana which is aimed to treat some forms of medical conditions, being legal under state laws. Based on animal studies, some cannabinoids may reduce spread of certain forms of cancer (including brain cancer). But marijuana can have different effects in different doses on different people. For instance, when taken by mouth the marijuana effects fade slower, as the Tetrahydrocannabinol (THC, C21H30O2) is absorbed badly, and when it is processed by the liver, it produces a second psychoactive compound that, in its turn, influences the brain differently. On the other hand, when marijuana is inhaled or smoked, THC enters the bloodstream transferring faster to the brain. In addition to that, scientists affirm that using solely marijuana as treatment in case of curing cancer may lead to serious health problems, because it may cause disorientation, anxiety, paranoia, sometimes can decrease blood pressure, increase heart rate, causing mood changes, trouble with memory, depression, mania, euphoria, or other mental illness. 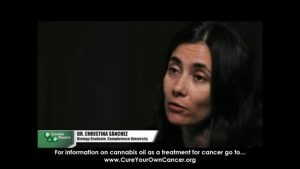 Various scientists bring different arguments, but recently some people suffering from different types of cancer confirm that they were cured using cannabis oil, whereas conventional doctors had not given them any life hope. Thus, in order to help my mother (but unfortunately I could not save her precious life), as a daughter and journalist, I really had to check a few urgent things about cannabis oil over cancer cells from a professional who had some proved experience related to this. 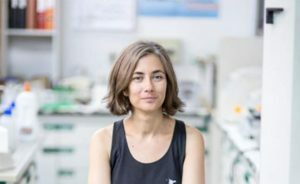 I began to search and, finally, decided to speak with Cristina Sánchez, PhD at the Department of Biochemistry and Molecular Biology I, from the Complutense University in Madrid, who once communicated to the cannainsider.com that in her research of 15 years she can say that cannabis kills cancer cells, whereas chemotherapy attacks immune system cells as well. 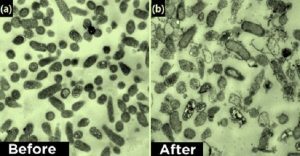 As the curative effect of cannabis oil (CO) is highly discussed among patients suffering from different type of cancer (especially in the UK), what cancer cells can the cannabis oil kill (or plant administrated in different ways)? Is it or can it be scientifically proved? In preclinical (non-human) models of cancer, THC and CBD have been proved to kill many different types of tumor cells. In humans, no controlled studies have been performed yet, and therefore we don’t know which tumors (if any) do respond to cannabis. Can it also kill adenocarcinomatic cells? Can the CO destroy or shrink the cancer cells (specifically the adenocarcinoma cells), and even metastasis? Or can it only prevent cancer cells to spread or generate tumours? Cannabinoids do kill cancer cells – in preclinical models of cancer (experiments on animals, mostly on rats), – and they also prevent the generation of metastasis, again in preclinical models of cancer. If it really works, what is the dose of the cannabis oil per day? Thus, the American Cancer Society, Cancer Action Network, the Society’s advocacy affiliate, has not taken a position on legalization of marijuana for medical purposes due to the need for more scientific research on its potential benefits and negative effects on human being. However, ACS CAN opposes the smoking of marijuana and other cannabinoids in public places since the carcinogens in marijuana smoke leads to health issues to themselves and those who are close by. Causing harm to human body just… like chemotherapy, which has different effects (sometimes prolonging the patients’ life, who have strong immune system, but also destroying the immune system and healthy cells) on different people, even causing death.